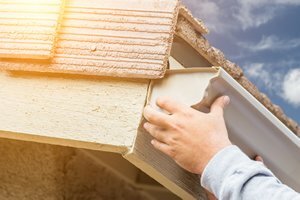 From installing a new gutter system to replacing the old one, The experts at Coverall's Total Home Improvement Inc. know how to get the job done correctly. 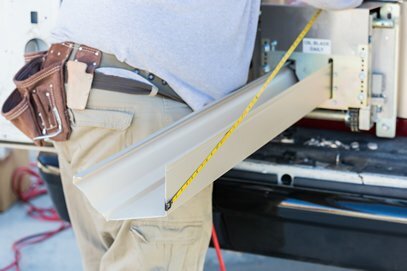 We always provide top-quality gutter services, using only the most advanced gutter technologies and techniques that are available. 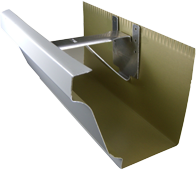 This ensures that you will be 100 percent satisfied with your gutter system needs. With so many gutter service contractors available, how do you begin to choose one? Let our top-rated company help you decide. Gutter Services from Coverall's Total Home Improvement Inc.
Coverall's Total Home Improvement Inc. has been installing gutters since . Our dedicated crew of gutter specialists makes their expertise evident on each job. Offering many years of superior protection, your new gutter system will also provide heightened curb appeal. If you intend to maintain your home's value and structural integrity, gutters are absolutely necessary. In knowing this, gutters and downspouts in poor condition often cause more problems than they solve. A properly installed, high-quality gutter system is one the most important investments you can make for your home. A new gutter system directs rainwater away from your foundation, siding, and landscaping effectively, maintaining your home's good condition. Ideally, gutter systems are intended to direct all rainwater out and away from your home, allowing it to soak into the ground without damaging structures or creating annoyances. However, gutters can become blocked with leaves, branches, and other types of unwanted debris. This causes your gutters to not do their job. Having a clogged gutter is like having no gutter-system at all, or sometimes can be worse. If you have the free time to do it, cleaning your gutters will prevent this from happening. But even if you do have the time to do so, many don't, cleaning your gutters out can be dangerous. If you're not physically able or don't have the patience to do the job properly, you take the risk of injuring yourself. We at Coverall's Total Home Improvement Inc. will clean your gutters and downspouts by hand. We then make sure to bag up all debris that has been removed and leave your property looking spotless. While we are cleaning your gutters, our technicians will also inspect the roof of your home for damaged shingles and other signs of roof problems for no additional charge. Our team will not only do that, but will also be sure to clean the actual face of the gutters, removing any dirty streaks to restore it's original color! The ideal time to get your gutters cleaned is in the spring or autumn. 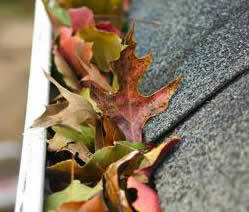 Many are aware that the most common culprits of packed gutters are fallen leaves. But many do not yet realize that the debris that falls from trees during and after a blooming period can also severely clog your gutters. 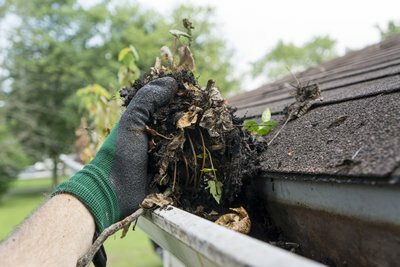 Coverall's Total Home Improvement Inc. does suggest that you clean your gutters at least twice a year. As a tip, we also suggest that when cleaning them during the fall season, to wait until all of the leaves have actually fallen to clean them. This will save you time, and more importantly, money! A professionally installed gutter system is definitely a must-have, but even a superior system sometimes needs a little maintenance or repair work. If a gutter in need of a little work is not fixed quickly, it can lead to much larger problems like leaks or rotten fascia boards. Even If you haven't noticed any problems with your gutter-system, it's always recommended that you schedule a regular check-up from Coverall's Total Home Improvement Inc..